200 minutes a night online - but what do they do? The main objection today was that I thought it was better to spend 200 minutes online than 200 minutes in front of the television, which is the swapover that is currently sweeping the UK teenspace. And as I've already said, I don't really think it matters what we think, because the kids are doing this anyway. The criticism has, however, pushed me into asking another question: what is it that kids do in those 200 minutes? From the Prenskys, Robinsons and Novembers of this world we would be under the belief that it is nearly always cognitively demanding stuff. But is there any observational research out there which tells us what proportion of time is spent IM-ing, blogging, Bebo-ing, researching for homework...? The chances are we would end up with a total pie chart of more than 200 minutes, with all the multitasking going on. Well, the research is there and it is high profile. This 2005 E-Society Paper (download as PDF) shows that most use of the net by kids is what most sensible people would call, well, sensible. Most of their use (on page 10) is for researching the web for homework. The references to IM and email are probably going on simulataneously meaning that an even larger chunk of time than is stated in the research is actually being invested in learning. And the sites they choose to look at (page 18) are invariably noble in their causes: environment, charity, human rights and, yes, government. As I said before, it's not that these kids are not interested in politics - they clearly are - it's just that we haven't shown them how to use their own self-publishing platform (Bebo, MSN Spaces, MySpace) to mobilise themselves and make their individual voices count as a collective. Now, instead of making kids power down when they enter school (a good Prensky-ism, that one) why don't we let them use their mobile computing devices and iPods to continue their high-powered learning. But here's the crunch - why don't we allow them use their online social spaces in school to do what they are apparently interested in: to engage with their society. It won't work just by opening up the ports to their sites, but we will have a wonderfully engaging educational experience showing them how to harness the power they already wield for the good of society. Then we would really have responsible citizens and effective contributors. Update: The RSA have posted audio from the first part and this second part of the conference. For me this is the whole point. Kids' private spaces as they stand should be separate. But their private pages are not something they, or we, should always be proud of. We need to teach kids that there really is no private when it comes to the web. This doesn't have to be a bad thing. In my case the human side of my blog has helped more than hindered. but it also raises a more fundamental question. how happy is humanity with the notion of work and play just merging into life? That's a bigger systemic issue to cfonsider outside the field of education as well as within it. You're preaching to the choir. As educators it's our responsibility to prepare students for life, and yes this includes the digital parts as well. Every time we block access to sites with only a potential for misuse, we punish the innocent and limit our students' growth. Play is how we learn, and students should be free to play. As educators it is our responsibility to make sure where they do this is safe. When we wall off whole categories of sites (e.g., social networking) we're putting up a wall and saying the pitch is off limits because we have no one to look after it. That's not being prudent, it's ignoring our responsibility. I might be preaching to the choir as far as teacher readers of the blog are concerned but for the large and growing number of non educationists these are new points, things very different from their own current knowledge of education, based itself on experiences many years out of date. It's important not to stop making the points as long as the audience is one who hasn't yet been convinced of them. I enjoy reading your blog. Thanks for the insightful reflection. Here is an example of an American politician who is trying to leverage new technologies and digital natives. Sorry Ewan, it's amazing how the interpretation of a single clause can go awry. My "preaching to the choir" comment was intended to read, "Hey, I'm with you. Let's spread the word." In no way was it meant to imply you/we shouldn’t be making these points. In fact, I believe it's our job to "make the better argument." As regards interesting and worthwhile research into 'what they do' and what it means for teachers, NCSL commissioned Demos to do some research which resulted in a report published in Jan 07 entitled 'Their Space - Education for a digital generation'. 1. The internet is too dangerous for children. 3. There is an epidemic of internet plagiarism in schools. 4. We're seeing the rise of a generation of passive consumers. 5. All gaming is good. 6. All children are cyberkids. And the report, whilst avoiding being prescriptive, hits several of the right nails on the head, for example that the Internet, and the freely available tools, ways of working and connecting, and the content that it provides, makes a pretty good (albeit incomplete) learning environment." Unfortunately, I don't think that the 'choir' includes most teachers. For many of my own colleagues these would be very new points and certainly out of their own experiences and perhaps we need to remember that we must convince that audience too. Internet is better than television. Interaction is better than none. Online time must be monitored, planned, and guided. Some have suggested social interaction through sites such as myspace. If this surfing is guided, this can be a very good thing, especially in regards to dealing with the real world. Stumpling across a predator posting... well, bad stuff -- this is a problem. 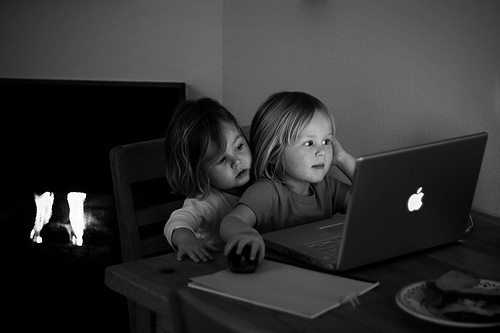 Setting the children of the world loose on the net without guidance is worse than giving them a remote. Walking them through the wonderful potential that is the world wide web is sublime.